From important school notices to special events, sporting achievements and brilliant work - we'll share it here. You can also download all current academic year issues of our regular school newsletter, the Hamlet Herald. ​Follow us on Twitter for up-to-the-minute news of what we're up to. In Year 6, we have been reading Munoz Ryan’s ‘The Dreamer’. It’s magical realist retelling of Pablo Neruda’s childhood has been encouraging all of us to dream big dreams. 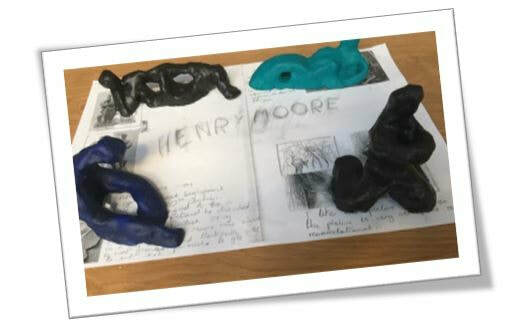 Year 6 have been looking at the abstracted sculpture of Henry Moore and responding with their own interpretations of the artist's work inspired by their Humanities topic of Refugees and Immigration. Y4 ​Retelling the story of Beowulf, which includes a few unfriendly faces! 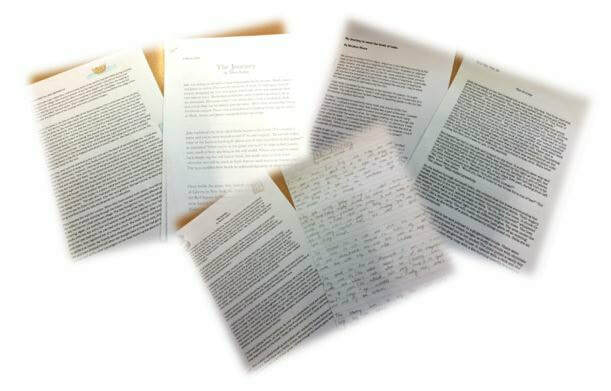 ​The staff and children have generated a short list through a series of in-class debates. We want YOU (Parents & Carers) to help us select the core values that make a Hamleteer. 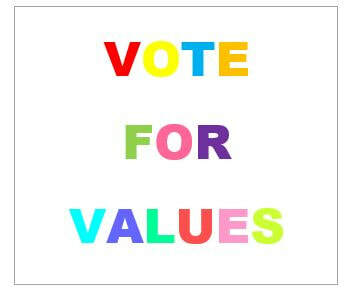 Please fill in a voting slip with your top 3 values from the shortlist, fold it once and either pop it in our ballot box under the shelter outside the office or ask your child to do so for you. Voting Starts Monday 3rd December & closes Wednesday 5th December. Such an incredible opportunity our talented students experienced on Friday, performing on behalf of Young Voices for BBC Music Day on top of the O2! It was lovely to see so many of you being expertly guided around our Art Exhibition this week. If anyone is unsure as to what the ‘glittering curriculum’ bit of our school vision is all about, then the Art Exhibition is one of the best examples! It was a pleasure to see what the children are working on throughout the course of the year, amazing work from all! In Year 4 we have been trying to solve the following question: On a digital clock showing 24 hour time, over a whole day, how many times does a 5 appear? Is it the same number for a 12 hour clock over a whole day? As a part of our learning next term on plants in Science and our study of Marianne North in Art, Year 5 visited Kew Gardens on Tuesday 8th May 2018. We have studied the different plants, taking photographs and visited the exhibition of Marianne North’s botanical paintings. 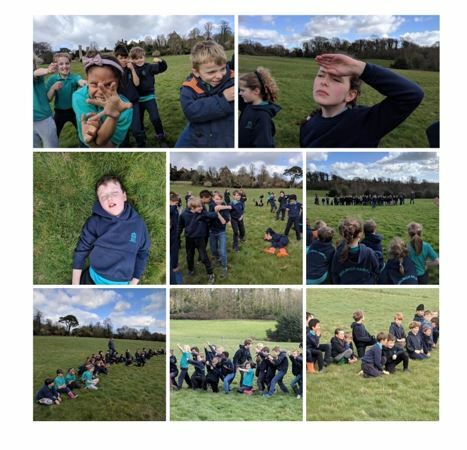 As part of our Maya topic, Year 6 tried their hands - or, more accurately, tried their hips, thighs, chests and shoulders - at the ancient Mesoamerican ball game Pok-a-Tok this week. The verdict: extremely difficult! However, we are pleased to report that no-one was ceremonially sacrificed to the gods for losing. That's all planned in for AFTER the SATs. You can watch the experts here. Year 3 started their Ancient Greece Topic with Greek Day. We made our own chitons, wrote our names in Greek, learnt a dance linked to Odysseus’ journey and made a mosaic inspired by some Ancient Greek objects. Year 5 have taken part in the cycling proficiency programme Bikeability for the first few weeks back, following the Easter holidays. The children have learnt how to check their bike is safe to ride; how & when to signal & carry out appropriate manoeuvres for riding around the local area. They have been having lots of fun in the process! Year 4 are reading their new text for this half term – Cloud Tea Monkeys, which is set in the tea plantations of India. This week, the children used their reading skills to infer what a tea plantation looked like, creating beautiful green pastel sketches to represent what they visualised. Year 4 enjoying some physical theatre as part of our trip to Union Chapel. The children also took part in creative writing and a science of sound workshop, all based around the organ. As part of their topic on Africa, Year 5 have been studying different types of African masks and use their sketching skills to draw them. Y3 started their new Plants topic in Science this week. We talked about the features of plants and then went outside to find some weeds that we could pull up and examine with our magnifying glasses. We talked about the way Victorian botanists had to make careful scientific drawings of plants and we did the same with the plants that we found. Year 5 have headed back to the pool this week where they have been working on refining the different strokes. This half term in year 3, we have been looking at rocks and fossils in science. This week, we made our own fossils, imprinting a figure into clay and using Plaster of Paris to create the fossil. Year 4 really enjoyed their polar explorers day this week! The children took part in a range of endurance, strength and survival activities to help them explore the Arctic. There’s lots to find out about other polar explorers such as Rosie Stancer. Captain Scott, and Roald Amundsen online. This week, Year 3 have been learning about the Stone Age and as part of that they have been looking at how the Neolithic people lived at Skara Brae. They designed their own Skara Brae houses and then used lego to build replicas. Year 4 are learning about states of matter in Science. This week they used data loggers to investigate the effect heat has on the rate an ice cube melts. The children then discussed any anomalies in their results and explained how they knew the ice had changed from a solid to a liquid. Year 3 have recreated the scene from our book Stone Age, when a child from the Stone Age and a child from the present day meet for the first time. How do they look to you? Nervous? Curious? Intrigued? On Tuesday 9th January, Year 5 were visited by a mobile planetarium. We got the chance to go inside and learn about all things space related. It was great to see the stars and different constellations on the ceiling of the dome and learn about the moon and sun in relation to planet Earth. As it was so dark inside, we unfortunately couldn’t get any pictures! Inspired by Henry Moore, Year 6 have been creating sculptures. We started by investigating the work of the famous British artist and critiquing his 'Reclining Figure'. Then, using our dance work on refugees, we made human freeze frames trying to encapsulate the journey of a migrant. From here, we used clay to make our own abstract statues. Year 5 investigated how commas are used to avoid ambiguity and had lots of fun acting out the sentences! Matt Haig, an award winning author, visited our school on Tuesday 28th November. 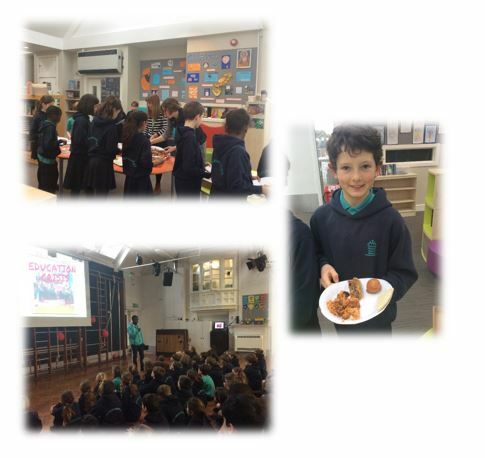 Year 5 and 6 enjoyed a fantastic, Christmas themed presentation, and then children from across the school bought signed copies of his latest book, which they are already really enjoying reading. Eddie (6S) has already read half the book and said that he's totally gripped! We are excited to announce that we have created a Times Table Rock Stars accounts for all the children. Please encourage your child to play for 5-10 minutes each day. You can download the app from Google or Apple play stores for both tablet and mobile devices. Please look out for the paper login information on Tuesday 28th November for years 5 and 6 and Tuesday 5th December for year 3 and 4. Year 3 has just started multiplication in maths, so we decided to take our learning outside and make arrays of the 3 times tables using chalk and anything that we could find in the playground! We also reminded ourselves about inverse operations, and tested commutative law to see if it works with all of the four operations. This week Year 5 made parachutes out of bin bags to test the effects of air resistance. They made different sized parachutes and made predictions about how fast each one would fall. 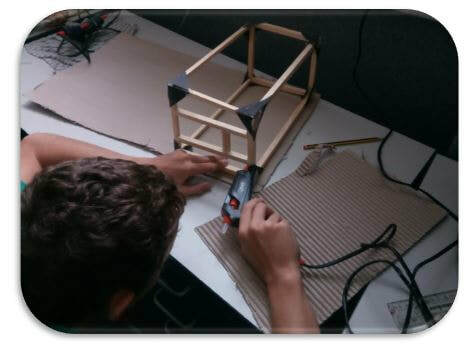 Design skills and teamwork were the key in this activity and the children did very well! This week, the children in Year 5 have been engrossed in our latest text… Frankenstein! We have been busy using aspirational vocabulary and structures in our writing, including the use of deliberate repetition of words and structures as well as the use of direct and reported speech. 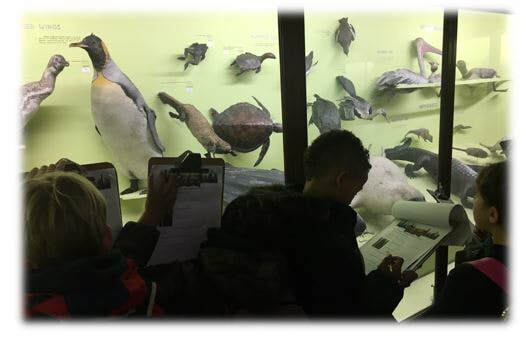 Year 4 visited the Horniman Museum this week, exploring different ways that animals can be grouped and classified, and observing microhabitats in the grounds. This links to our current science topic: Animals and their habitats. We later had a visitor from the RSPB to talk to us about the changes we can make at the Hamlet to further promote small wildlife in our school garden. This week, Year 5 have been busy putting the final touches to their William Morris inspired art work. Come along to our ‘Open Classroom’ event Wednesday 22nd November to see some more! This week, year 3 had a visit from the Thames Explorer Outreach Program. They talked to us all about how food is brought to us from all around the world. They also gave us some historical facts about the River Thames. We demonstrated how machinery has replaced people over time by playing a sugar cube game, where the winning team, the team who got their sugar onto the boat first, lost their jobs anyway, as they were replaced by machinery. Year 3 went on a stroll along the Southbank to look at human and physical geographic features of the River Thames. We stopped on the Millennium Bridge to do some sketching and even had a police boat put on a show for us! This week, Year 5 applied their knowledge of separation processes to identify the ingredients in ‘Alien Soup’. Using a combination of magnets, colanders, sieves, filter paper and fingers, they identified some surprisingly terrestrial ingredients: marbles, chickpeas, paper clips, sand, rice, salt and water. The children of Year 6 were this week transported to the wilds of a heath in Scotland. They were introduced to a group of “weird sisters” and met a murderous and ambitious couple who were desperate to become king and queen. All this took place in the confines of Turney Hall, thanks to the Young Shakespeare Company, who performed an amazing version of Macbeth on Wednesday morning. The five actors also gave the children a chance to perform, either individually, or in the crowd scenes at court and in battle. There was much re-enactment in the playground afterwards! Year 3 were making fruit smoothies this week. We had 2 attempts at perfection and all will be tasted by Mrs Purcell for the grand finale! Year 5 are having a great time on their residential trip to Land & Wave this week. This week, Year 3 joined hundreds of other primary school children from across London at the Albert Hall. We were part of the audience for the Primary Proms. It was fantastic to have the opportunity to experience live music making in one of the world’s most famous concert halls. In Year 6 this week we have been making Anderson shelters and writing up instructions for how to make them. This week, Year 3 have been dissecting owl pellets, we identified bones and parts of skeletons that we discovered inside and checked them against a chart to see which animals the owl had eaten! Year 5 had their final session at the pool this week and focused on life saving skills. They did this in their pyjamas to recreate a real life situation. ​Year 6 have been working as historians, researching old boys and staff of Dulwich Hamlet School, who died in World War One. We cross referenced some photos found in our archives with the memorial plaque in the playground and researched these names on the Commonwealth War Graves Commission Website. We also found the records of a Henrich Hentschel who died fighting for the Germans. He is commemorated at our school and we hope to visit his grave in a British cemetery in Arrasit. 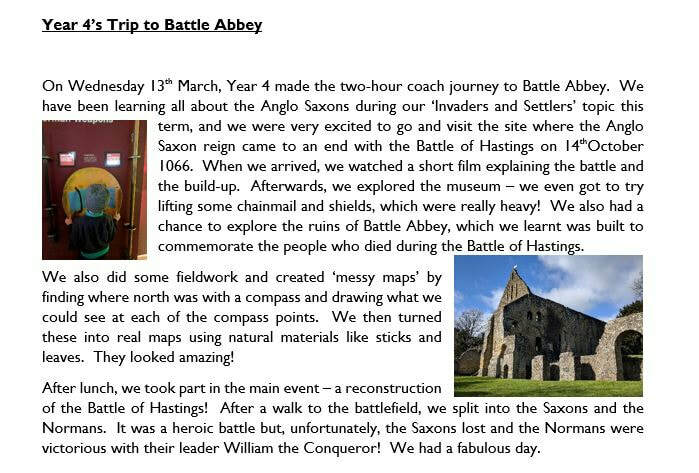 ​Year 3 had a brilliant day out on Monday! We visited Horton Kirby and spent most of the day up to our wellies, measuring the depth and flow of the River Darent. The River Darent (River Darenth) is a Kentish tributary of the River Thames. Its name is believed to be derived from the Celtic word derva, meaning oak, and thus 'the river where oak-trees grow'. The Darent is about 40 km (25 miles) in length. It rises in several springs around the village of Westerham in Kent. Here Year 4 are investigating how the size of a drum effects the volume of the noise made! Did you know that the speed of sound is around 767 miles per hour (1,230 kilometres per hour)? Year 5 carrying out an investigation to find out what makes a good thermal insulator. The challenge was to to see which team could keep hot water at the highest temperature over a period of 30 minutes. The results were somewhat confusing! Year 5 took a trip back in time this week as they visited the Ragged School Museum. They were fully immersed into what life would have been like for children during the Victorian era, experiencing a typical lesson and a taking part in a handling session in a Victorian kitchen. Lego at lunchtime! these three buys designed a wonderful dragon head, can't wait to see the finished build! The plural of LEGO is LEGO. It doesn’t matter if you have one or one hundred pieces of LEGO, it’s still LEGO – although many people call them LEGOs. LEGO comes from the Danish word leg godt. Leg godt means “play well” in Danish and LEGO is made from the first two letters of each word. LEGO is 85 years old. The LEGO Group began in 1932 in Billund, Denmark and was founded by Ole Kirk Christiansen. The company is 85 years old, but the interlocking LEGO blocks were manufactured from 1949. This makes the LEGO blocks we all know and love 66 years old. Ole Kirk Christiansen was a carpenter. He lost his business and began to make toys out of his leftover wood. He was inspired to construct a small wooden duck toy for his children and when they loved it he put them into production to sell. Hamlet on Instagram - As part of our continuing drive to improve our communication and to coincide with #saferinternetday we can now announce our Instagram account @dulwichhamletjs. As some of you know, we have had a presence on Twitter for some time now. We will continue to use Twitter to engage with the "tweacher" community, post live updates and connect with local schools and interested parties. 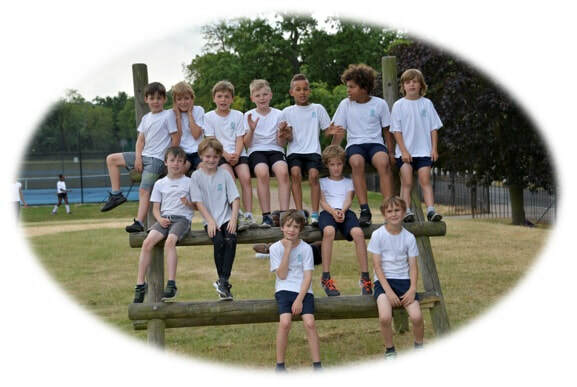 However to reach more parents our Instagram account will now also provide a glimpse of the rich and varied learning which happens in each year group every week. A huge ‘thank you’ to the DHJS team, specifically Miss Campbell, for giving our Choir members the ‘night of their life’ at the O2 Young Voices concert, The children sang their hearts out. Dulwich Hamlet has fended off a planned alien invasion. Aliens crash-landed a spaceship in our playground and interrupted an assembly with a chilling warning of their evil plans. Unfortunately for them, as most of you know, this school is also a secret government research facility and so our engineering teams were set to work designing a range of defence mechanisms including: making armour suits, cooking up anti-alien goo, creating helium escape pods, coding advance reconnaissance robots and designing 21st century Anderson Shelters. Funnily enough we haven't heard from the aliens ever since: either they have returned home or are living among us, unseen and unheard. School Travel Plan Champions award. Wow! Thank you Dulwich Hamlet children, parents & carers you have brought joy and happiness to 98 families. much appreciated by some of the most deprived communities.